Throughout the year the SWCD attends a variety of local events. These can range from fairs, group speeches and school events. The district is always looking for more ways to reach out to the public and provide awareness of what we can offer and what we do for the county. Below are just a few events we have attended and some that we do every year. The Envirothon is a national, natural resource competition for high school students, each representing a single high school, progressing from the county or regional competition to state and national levels. Envirothons are organized by local Soil and Water Conservation Districts in partnership with school teachers. Teams include three to five students. The Envirothon began in Pennsylvania in 1979. 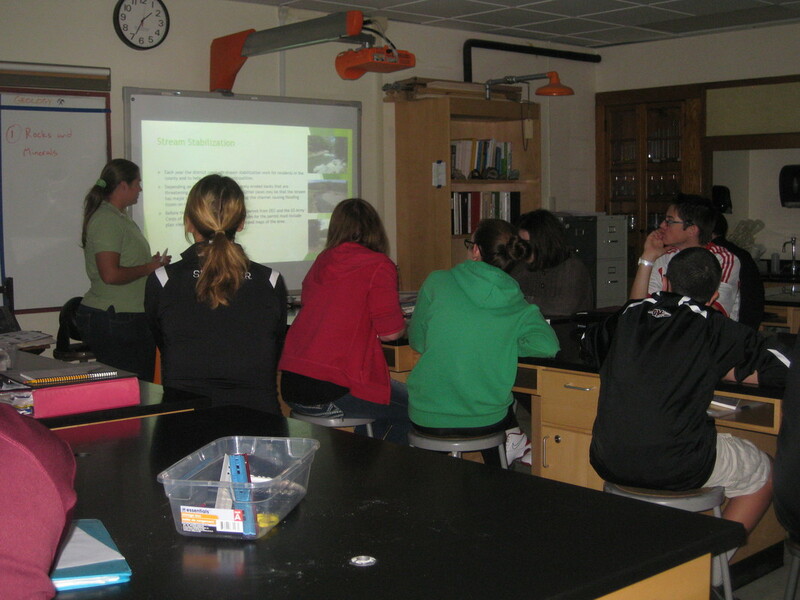 New York State held its first Envirothon in 1990 and Schuyler County held its first Envirothon in 1997. The Envirothon competition involves five categories on which teams are tested: Aquatics, Forestry, Soils, Wildlife and a current events category that changes each year. The current events category has covered topics such as greenways, pesticides, watersheds, wildfire management, wetlands, agriculture and climate change. 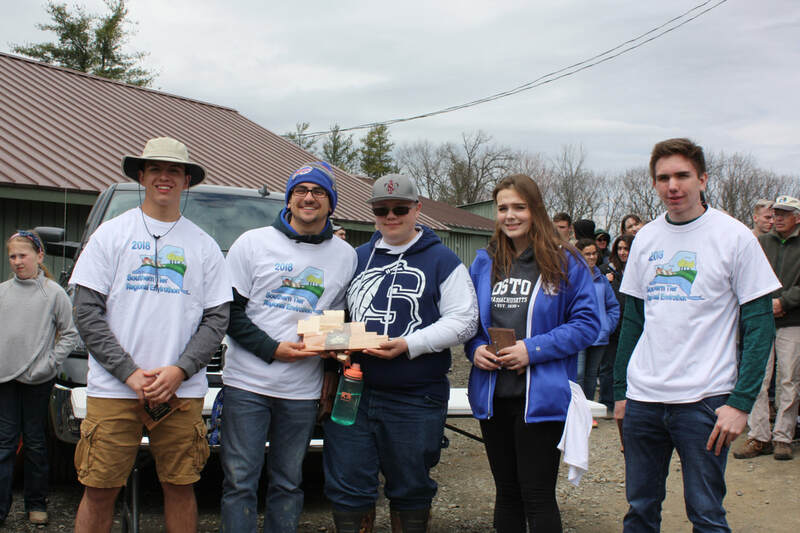 High school students from all three Schuyler County schools participate in the Southern Tier Regional Envirothon (held annually the last Thursday of May in Owego, NY) competing against other teams from the County. The winner of the County Envirothon then goes on to compete at the State Envirothon. The District organizes the regional event with other participating SWCD’s (Chemung, Tioga, Tompkins, and Broome). In addition to organization and putting together educational programs and training for the teams, the District is responsible for fund raising. Various incentives for sponsorship for you or your organization include District Newsletter acknowledgement, “Friends of the District” status and conservation blue bird boxes. To become a sponsor of this event contact the District today. The 2018 Schuyler County winning team from Odessa-Montour Central School "The Otters". 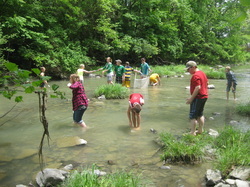 The Conservation Field Day event is a joint education experience organized by the District. Every year since 1963 the 6th grade students from Watkins Glen Elementary, Odessa-Montour and Bradford Schools travel to an outdoor location to learn about the environment from environmental professionals. 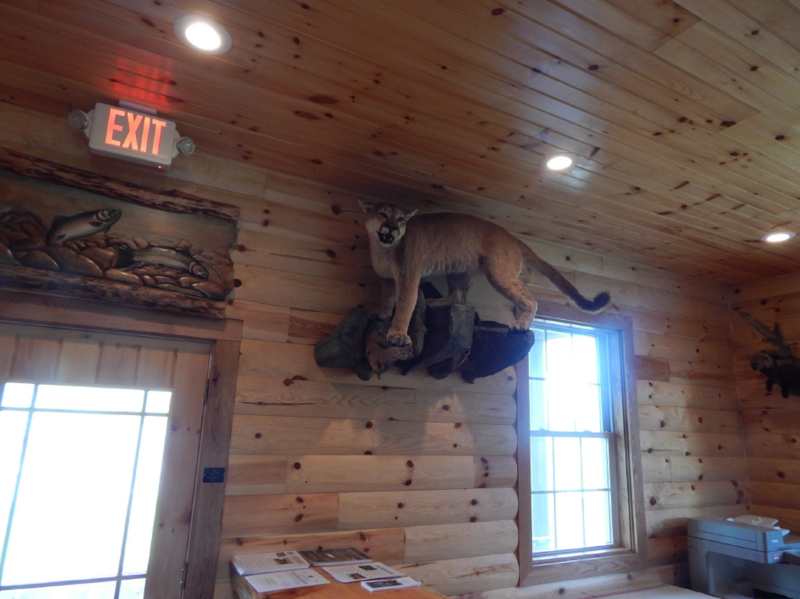 Past locations have included Watkins Glen State Park, the Hector Land Use Area at the Finger Lakes National Forest, Hidden Valley 4-H Youth Camp and the Millport Hunting and Fishing Club. The CFD event allows students unique educational experience learning about environmental issues and concepts directly from the professionals in the field. 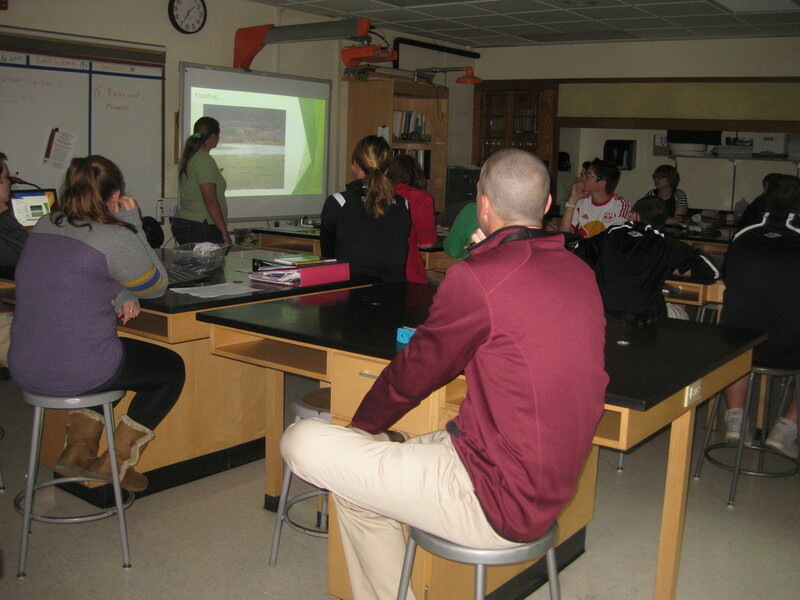 Topics covered in the past have included watershed concepts, outdoor awareness, ornithology, geology, wetland ecology, recycling, tree identification, agriculture, and among others. If you would like to learn more or become a presenter for this event contact the District. Below are some of the stations we had this past year at CFD. ​ Watkins Glen and Odessa Montour Schools. Fishing station teaches the students about fish identification and gives those who have never went fishing the opportunity to catch a fish. We would like to thank McIntyre's Bait and Tackle for supplying the worms and Mark Richer, Chemung SWCD and Jim Tobey for assisting at this station. Archery station gives students the opportunity to learn about bow safety and they get to shoot a bow themselves. We would like to thank Rick Evans and Jerry Harnas for teaching the students and the Schuyler County 4H for supplying the equipment. Sergeant Ziegler of the Schuyler County Sheriff Department showed students how dogs are used in the field for tracking, handler protection and narcotic searches. Students were able to meet one of the K-9 dogs and see them track. We would like to thank Sergeant Ziegler from Schuyler County Sheriff Department for coming and talking with the students about the K-9 program. Trapping and tracking station with local trapper, John Olin from Town of Orange. 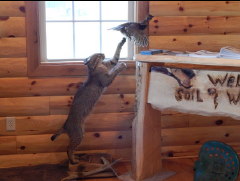 Students are able to learn how to track animals and the state laws on trapping. Olin also brings skins and skulls to learn about animal identification. We would like to thank John Olin for coming to this event and showing the students what he does. Fire safety station with the Watkins Glen Fire Department. The students were able to get a closer look at one of the fire trucks and get a chance to put on a fireman's suit. They also were able to spray the hose and learn about fire safety. We would like to thank the Watkins Glen Fire Department for coming and showing the students your equipment. Bob O'Brien from Cotton Hanlon Inc. came to talk to the students about forestry and how to measure DBH (Diameter at breast height), tree identification and more. We would like to thank Bob O'Brien for coming and teaching the students about forestry. Bird of prey station with Tanglewood Nature Center. Students were able to see some birds and learn about them. Some of the birds that were brought included the Great Horned Owl and an American Kestrel. We would like to thank Laine Sempler at the Tanglewood Nature Center for bringing the birds and teaching the students about them. 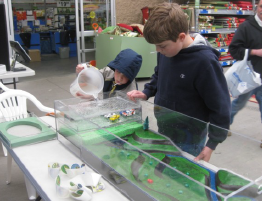 Floodplain model station provided a hands-on activity to show students how important floodplains are and the impacts between impervious and porous surfaces. 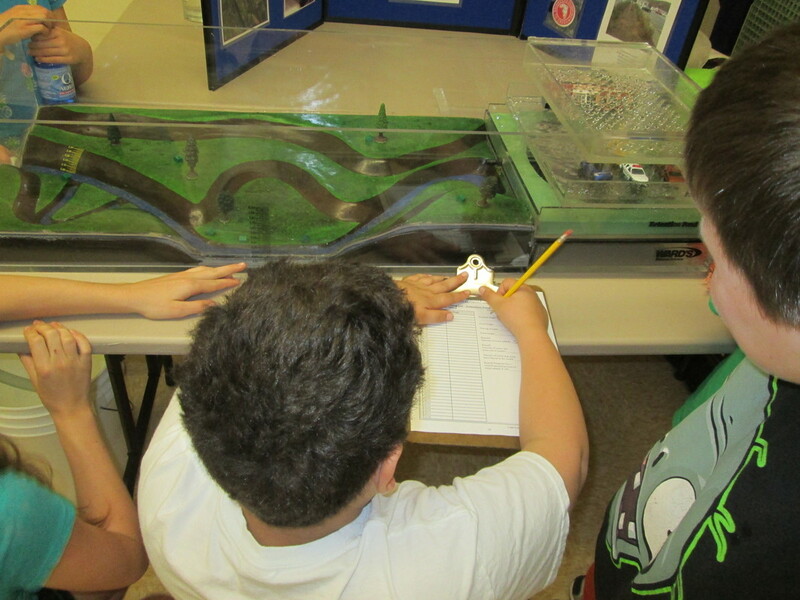 We would like to thank Janet Thigpen of Southern Tier Central Regional Planning for bringing the model for the students. 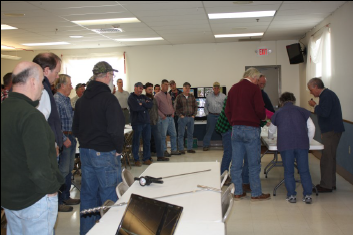 ​The Schuyler and Chemung County Soil and Water Conservation Districts put on a joint soil health educational event for area farms and municipal officials. This event showcased a broad range of information that allowed for hands on participation, and a one stop shop for area farmers. There was over 50 attendees from across the region. ​The Soil and Water Conservation Center obtained funding through the Finger Lakes Lake Ontario Watershed Alliance for wildlife education. The Soil and Water District is proud of their exhibit of taxidermy from around the region. The Soil and Water Conservation District welcomes all residents to come see it. ​In a joint effort with the Upper Susquehanna Coalition (USC), a tour of area farms was held for conservation professionals to pro-mote the use of and understanding of the Conservation Reserve Program (CRP) and the Conservation Reserve Enhancement Pro-gram (CREP). These two outstanding federal programs are utilized to install riparian buffers to help protect our fresh water resources. The tour was well attended by many state, federal and local agency personnel. ​For the 14-15 school year stream stations have been set up by the district for Watkins Glen, Odessa and Bradford School Districts. At these stations are two posts where the classes will use the lesson plans provided to work within the stream. 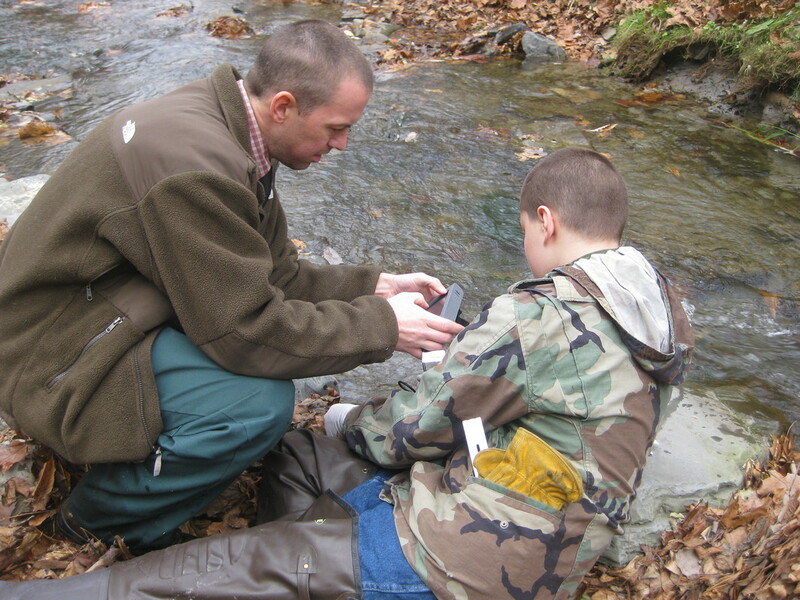 These lesson plans will help provide a STEM learning environment and gets the students to understand streams and how they act throughout the year. This also gives them a better idea of what the district does when looking at streams for stabilization work. If you come across the posts please do not remove them. 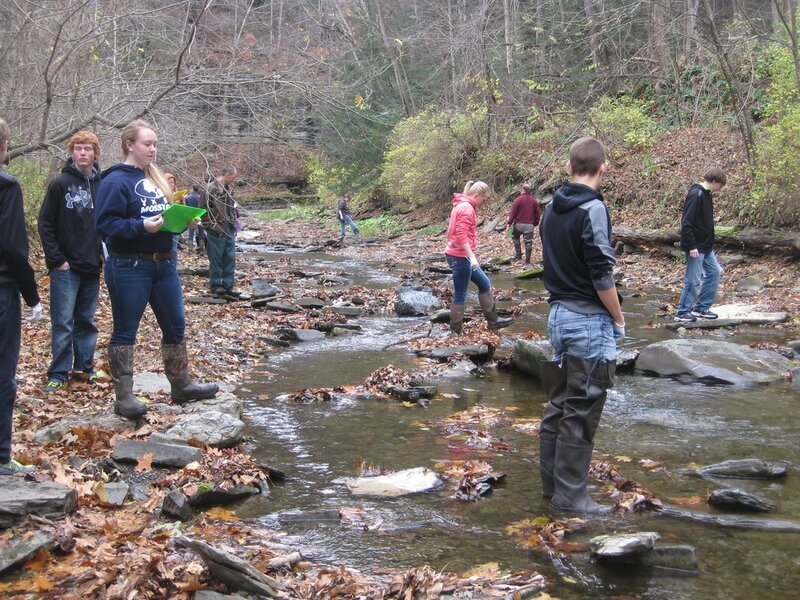 They do have signs posted to them saying it is for the school stream monitoring project.​ The photos below are from Mr. Talbort's Earth Science class at Odessa-Montour School using the stream site at Havana Glen. 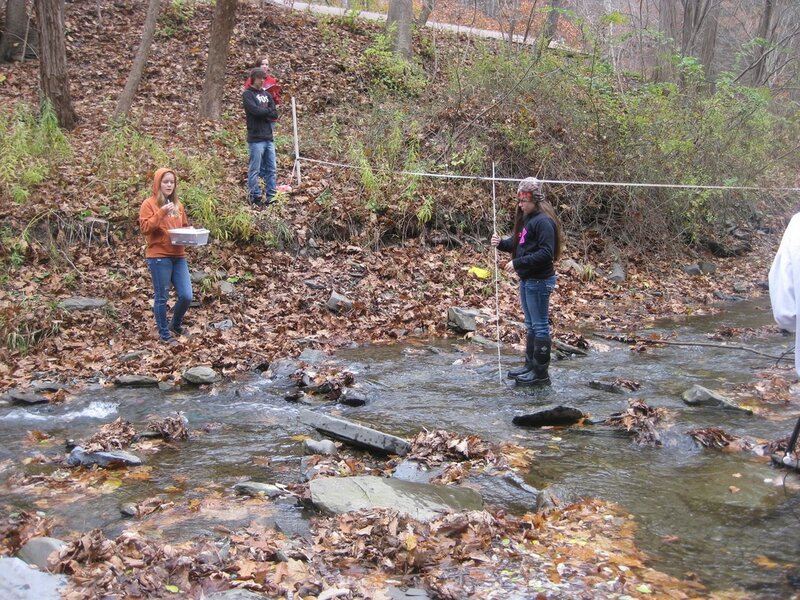 ​Rebecca Smith and Elaine Dalyrmple were asked by Kevin Talbort at Odessa Montour School to come in and talk about the District and give an introduction into the stream sampling they would be doing at the site. In 2014 the district was asked to be a part of the STEM day that the CCE was putting together during the kids Spring break last school year. 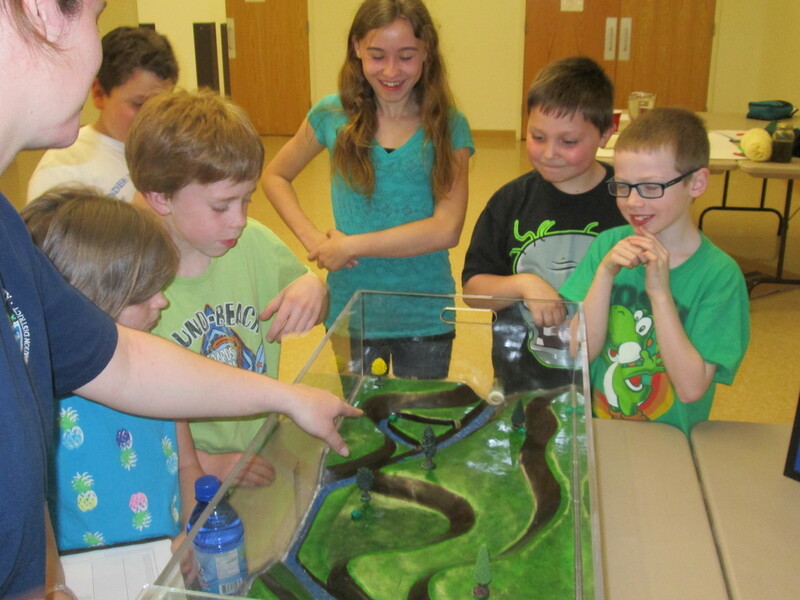 Rebecca Smith, the District Technician brought the Floodplain Model to teach the students about floodplains and how important they are. The model shows the difference between porous and impervious surfaces. In addition to how levees or dams impact the water velocity in streams. ​Elaine Dalrymple, invited the Watkins Glen Boy Scout Troop 2674 to do a gardening workshop. In this workshop, Elaine introduced the students to our vegetable garden and talked about how important soils is to farmers. In 2012, the district was invited to attend Walmart's garden center opening and have a booth to set up for the public. The floodplain model was brought to show the importance of floodplains and the impacts of impervious vs. porous pavements. 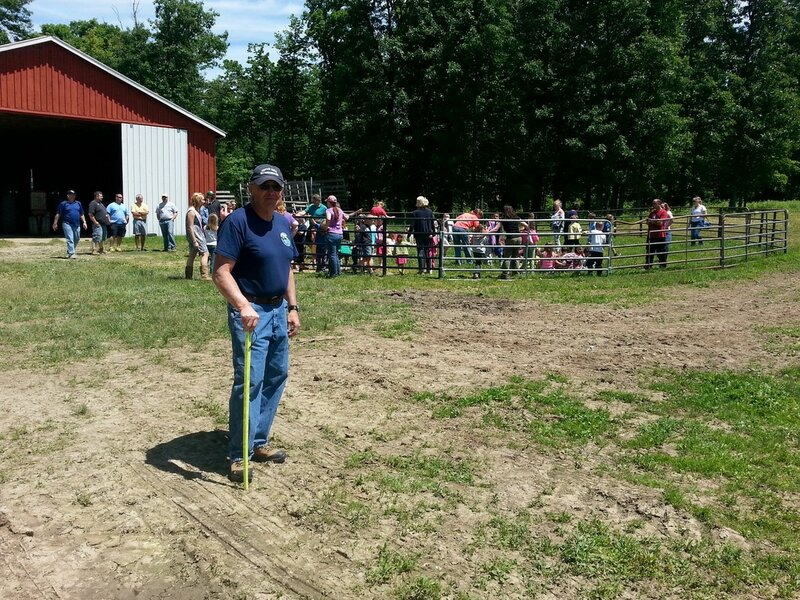 ​John and Jackie Wicham, Grazing Specialists, from Schuyler County Soil and Water Conservation District helped to lead discussions on farming, with a focus on rotational grazing for a group of Trumansburg students. The Gunning’s have been gracious hosts of this event for several years. 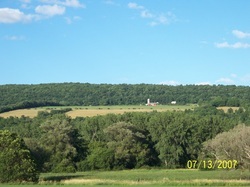 In 2011, the Schuyler County and Chemung County Soil and Water Conservation Districts hosted a tour for the New York State Soil and Water Conservation Committee, a Division of Agriculture and Markets. 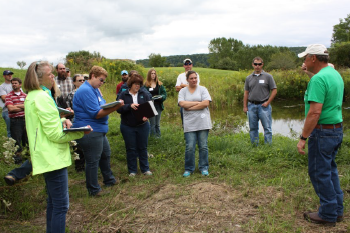 The tour visited the Chemung County Facilities, stream stabilization work, stormwater work, and then headed to Schuyler and Seneca Counties for a focus on Agricultural BMP’s on Vineyards and how they can vary from vineyard to vineyard. 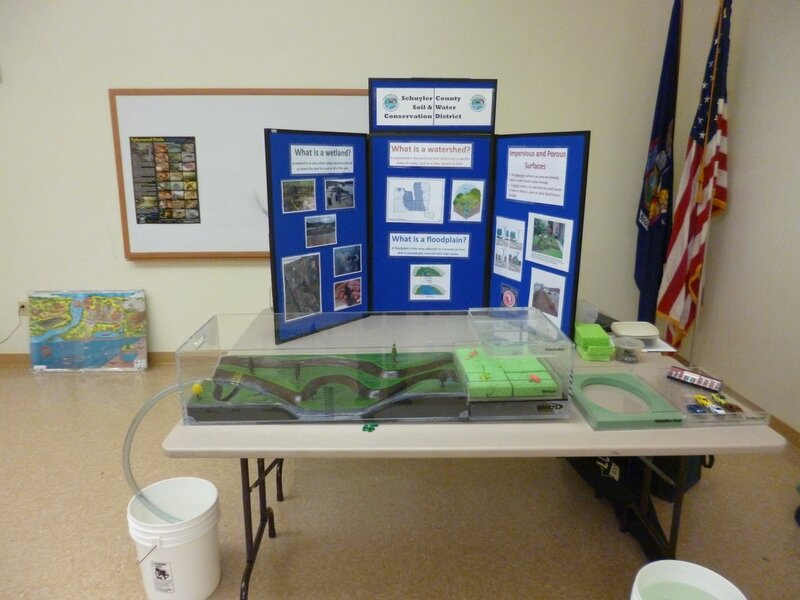 In 2011, our District Field Manager, Elaine Dalrymple, did a presentation for the Associations annual meeting on the Best Manage-ment Practices (BMP’s) that have been installed in the Watershed by the Schuyler County Soil and Water Conservation Dis-trict, as well as the benefits Agriculture has on the Watershed. 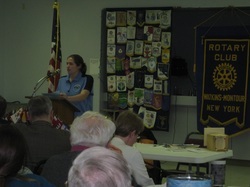 In 2012, the SWCD was asked to speak to the Watkins Glen Rotary Club about the tree program along with the many other programs we have. 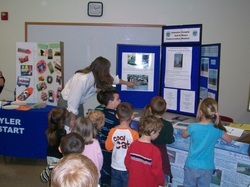 In 2009, the Soil and Water Conservation District had a hands on display for head start students to draw a rain garden. This event was held at the Human Resources Complex as an open house to Schuyler County Government. Along with local events, their are a few regional events that we attend. A few of them are Empire Farm Days, the State Envirothon, and we also go to the NYS Fair in Syracuse.